Awesome Man can shoot positronic rays out of his eyeballs, fly as straight asan arrow, and hug mutant Jell-O! Even villains like Professor Von Evil and the Flaming Eyeball are no match for this caped crusader. 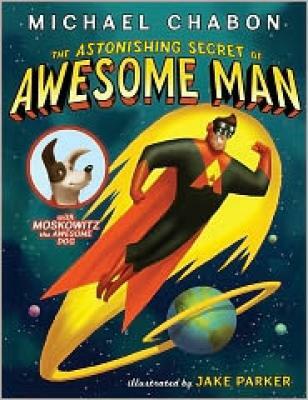 But Awesome Man also has a secret. . . . Can you guess what it is? The first picture book from Pulitzer Prize-winning novelist Michael Chabon perfectly captures the fantasy life of young superhero fans. Jake Parker is an illustrator and an artist for animated films. He also draws comics of space mice, monsters, and funny robots. He wrote and illustrated the comic book Missile Mouse. Jake lives in Provo, Utah, with his family. Praise for SUMMERLAND: “Packed with magic, adventure, myth, and America’s favorite pastime, this book will enchant its audience.